Experience a great balance of power and efficiency with the stylish and portable Apple iPad 4th Generation 128 GB tablet PC. Powered by a dual-core 1.4 GHz Apple A6X processor, this black Apple iPad (Unlocked) facilitates high-end gaming, surfing and overall performance. Moreover, this Apple iPad’s 9.7-inch multi-touch screen with Retina display, supporting a resolution of 2048 x 1536 (QXGA), delivers razor-sharp images and videos with vibrant colors and rich detail. With its 128 GB memory capacity, the Apple iPad 4th Generation tablet PC gives you the liberty to store all your important data. 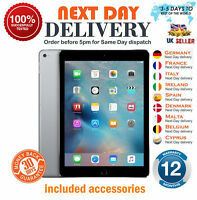 Supporting Wi-Fi and 4G connectivity, this Apple iPad 4th Generation tablet PC enables you to surf the Web, check emails, chat with friends, download videos and games at high speeds. What’s more, with a 5 MP rear camera, this Apple iPad enables you to capture stunning, high-quality images with amazing clarity. This device is unlocked and compatible with O2, Three, Vodafone (UK) and EE Carriers. A very good value essential companion. Very good value and useful. Very pleased. iPad as described in very good condition works well. 120g is well worth a bit more money.